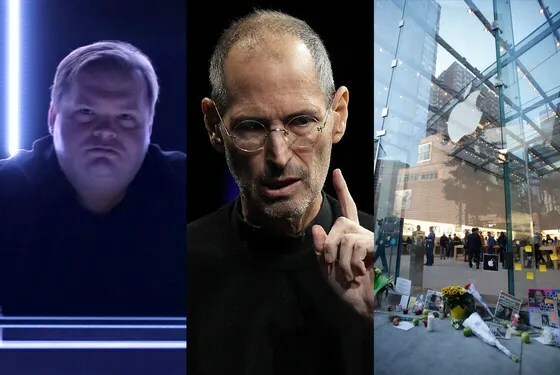 I found the video “The Agony and Ecstasy of Steve Jobs” to provide a very interesting perspective on Mike Daisey’s performance. I liked how there were periodic breaks in the performance to give commentary and additional notes to judge the validity of Daisey’s statements and provide additional sources. The use of additional sources and perspectives put less weight on the Daisey’s story and offers the audience a more balanced and “true” point of view than Daisey’s original performance. The historical portion of the performance also gave validity to the overall performance, as it presented facts easily accessible from other sources, rather than purely personal anecdotes where we have to take the speaker at their word. When questionable anecdotes were used, there was a break in the performance to clarify or question the truth of the speaker’s remarks. The performance stressed that we should always know where our products come from and should investigate the origin ourselves. It is important to note the difference between theater and journalism and fact and fiction. The play raises interesting questions as to what is true versus what is untrue and how can we know the difference. I think that the play took a good approach in providing many different ways of presenting the information. It included personal anecdotes from both Daisey’s and Bucknell students’ trips to China, interviews with Steve Jobs, historical facts on Apple and the state of China, clips from the retraction of Daisey’s article and others. These gave the presentation more credibility, even though it was very clearly presented as theater rather than journalism, giving the audience very informational and moving entertainment. Aiding a Cause or Causing Agony? The end of the play was my favorite part. 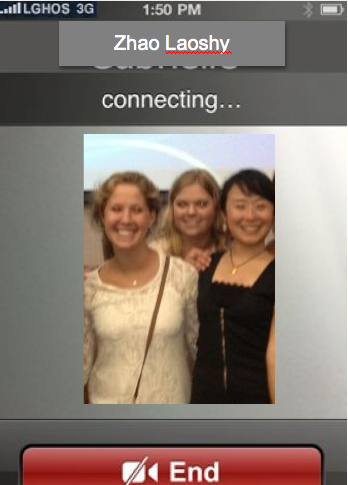 The professor’s real life experience in China was enlightening. I liked her description of the jobs as being mundane and boring but not in horrible conditions. When she says that, “value judgment isn’t as simple as it seems at first,” I truly thought about my reaction to our original introduction to Daisey. I could not believe the conditions people worked in and that we accepted it by buying these products. But the realization that people know what the working conditions are like before accepting jobs and willingly working in these factories makes a bit different. It’s still not completely fair or right, but the jobs in these factories give workers their well-being. It’s hard to know where to draw the line between being forced to work and working willingly when conditions are bad. In a way, these people are forced to work in order to sustain their lives and the lives of their families and factory jobs are the only ones they can get. On the other hand, they apply for and accept these jobs that happen to bring us these great products. I have a hard time deciding whether or not buying the product is buying into a belief that it is okay and we are just giving people jobs or if it is in fact our consumerism that is adding to a horrible world practice. The professor in the play helped me to lean toward the former with her statement of economic purpose, but I find myself still hesitant to except either position. Last semester I worked with a student from China in a group project in which we had to do extensive research on a public company. We chose Gap, Inc. He was very passionate about exposing the child labor scandal Gap had in Indonesia. They apparently were using sweat shops similarly to how Daisey explained Apple to be. So we were interested in asking if he was concerned about similar cases in China. Being from Hong Kong, he did not have any direct connection to the“sweat shop” like factories and seemed more interested in discussing that poor working conditions are not just in China, but all over the world. It was almost as if he was upset China was labeled this way. I really enjoyed Bucknell’s adaption of Mike Daisey’s play they called “”un/real and un/true: The Agony and the Ecstasy of Steve Jobs.” I thought that the combination of Daisey’s original story with the interludes throughout the play was particularly interesting in telling the story of Apple’s history. Although I enjoyed the play, the one thing that bothered me about Bucknell’s play was that I was not entirely sure what they were trying to accomplish with the play. In Daisey’s version it is clear that Daisey was trying to bring to light the working conditions in Foxconn’s factories in China. In Bucknell’s version, there were too many things going on throughout the hour and a half. Was Bucknell’s adaption to tell a more truthful version of Daisey’s story, to point out Daisey’s faults, or to tell the story of Steve Jobs? To me, the fact their play went in so many different directions, it took away from the overall product. A friend of mine, Bo Yao, who is a senior at Bucknell, grew up in China and came to the United States for an education. I’ve known him for almost three years but I’ve never actually talked to him about life in China before. So it was interesting to hear what he had to say. One thing that he told me, which was a surprised about, was that the workers in China are starting to get more power. They are demanding higher wages and better working conditions. The problem with this though is that many manufacturers are leaving China and moving to Southeast Asia because labor costs are cheaper there. After hearing all the stories about the working conditions in China, it is hard to imagine that there are countries where they are even worse. I really enjoyed the performance because it effectively pointed out the lies of Mike Daisey’s story in a creative way. One of the most important issues I realized while watching was that, even though we think we have an idea, most of us Americans really don’t know what it’s like in China. We all use electronics and other products made in China but we often ignore the details of how these products were made, what the factories are like, or how the workers are treated. As the professor said, the issue is not whether or not Mike Daisey lied, but that Americans don’t understand China’s culture. We don’t see that these jobs are sometimes the only way to escape poverty. A statistic that stood out to me was that 50% of all of the world’s electronics were made at Foxconn. Yet, many Americans have never heard of the city of Shenzhen. It seems ironic that we don’t know anything about a city where a lot of the electronics we use were made. Apple products have become central to many American’s lives that it’s almost like a religion. Still, most people don’t seem to care where these products come from or how they were made because it simply doesn’t matter to them. The fact is, most of us don’t understand what it’s like to live in a country where so many workers are treated so poorly to make products that are shipped off to place that doesn’t care about the manufacturing process. I do not personally know any students here that are from China, but I think it would be very interesting to hear their perspectives on this issue. As I learned from reading “The Working Poor” for another class, bad working conditions are in all parts of the world, including America. The book pointed out that people who work hard should not be treated as poorly as they often are. I immediately thought of the foxconn workers who seem to be working very hard but not getting rewarded accordingly. How much lying does it take for one to believe their deceit as actual truth? Mike Daisey’s monologue was so believable that it seems as if he truly believes that his words are reality. Bucknell’s own rendition of his monologue casts a shadow over his words, using video breaks in order to display his exaggerations and flat out lies. I specifically enjoyed the Steve Jobs video that involved Foxconn where he states bluntly, “Foxconn is not a sweatshop.” He tells the interviewers that there are restaurants, movie theaters, and swimming pools at Foxconn, far different from Daisey’s dark description of the factory. His addressing of the suicide rate at a working place of 400,000 being less than that it is in America also puts a damper on Daisey’s convoluted words. Daisey’s usage of dramatic pauses during his monologue actually works against him in this rendition, for Bucknell used them to display more truthful facts that he avoided. 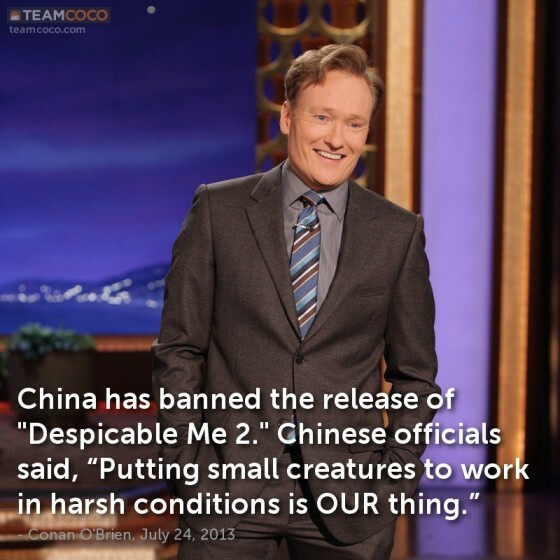 This begs the question though, should we completely discredit everything he has said about working conditions in China? Are they exaggerated and should America stop worrying about what they cannot understand? This is where people must look outside of one man’s deceit and see the bigger picture that he was attempting to convey. Andrew Somers and I interviewed our friend Bo Yao, a Chinese Chemical Engineering Student here at Bucknell. After asking him about the work life in China he had many of the similar stances that Daisey took in his monologue. He says that the working conditions are much worse in China than in the US, and that it is very labor intensive with little job guarantees. The factory shift towards Southeast Asia he states is because of the lower wage requirements in that sector of China. Bo even says that government jobs, although hard to get, are not even that high paying. Health insurance and free traveling are benefits, but it is still not as glamorous as one would believe. Overall, there are obviously labor issues in China that need to be addressed, and Mike Daisey tries to show his listeners that with the powerful usage of verbal imagery. However, his lying has turned people off and the real issues that he wanted people to hear about may not garner the same attention that it should. At first glance/first listen, Bucknell’s adaptation of “The Agony and ecstasy of Steve Jobs,” seemed extremely similar to Mike Daisy’s performance, but I soon found out that the similarities ran short. In the part “The second coming” I believe that the writers hit Apple spot on. When he says (I am paraphrasing), we are apple, we have exquisite taste, we know better than you about what you want. Where does the responsibility fall? After listening/watching to Bucknell’s own adaptation of Mike Daisey’s “The Agony and the Ecstasy of Steve Jobs,” there are a couple directions in which I would like to take this blog post. Firstly, I would like to comment on the style of the production and some of the key differences between this version and that of Mike Daisey. Overall, I felt that the way in which the show was put on was very effective in that the producers were able to weave in supplementary lessons throughout the show that were very informative. For example, one of the first lessons came from a Chinese professor who spoke about some of the cultural misunderstandings that Americans tend to have about China and its culture. Specifically, he makes an important point about how, although the working conditions are not great, there are thousands of Chinese that jump at the chance to work at a place like FoxConn. So, unlike some may believe, it is not a situation where these people are being forced into these conditions, but rather they are seeking out the chance to get jobs which offer real opportunity. In addition, these periodic pauses throughout the show not only allow us to get more information, but also offer a chance for us to question what Daisey is saying. For example, the show chooses to include an interview of Steve Jobs specifically about this issue so that we can hear the perspective of the accused and therefore have a better chance to form an objective opinion. Of all of the information pauses/ mini lessons in the production, the one that really stands out in my mind is the one that featured the Civil Engineering Professor who had recently returned from a trip to China. In particular, there were two interesting points that I took away from her discussion with the first having to do with the proliferation of manual labor in China. During her visit, Professor Vigeant had the chance to visit a local printing company in which she learned that manual labor was a pivotal part to its operations. Specifically, the company had a binding machine for the paper, but required that each piece of paper be folded first. Rather than using a machine to do so, the company specifically employs workers to manually fold this paper all day. What’s particularly interesting about this is the fact that the company managers justify this choice because it is so much more cost effective that they are willing to sacrifice the increased efficiency that would come by using a machine. Ultimately, Vigeant then goes onto reveal that manual labor is extremely common in China which shocked me as it seems a little ‘primitive’ for a country that everyone raves about as such a booming industrial nation. Though a very interesting point, the use of manual labor was not the most though-provoking idea that came from this discussion. For me, the most important point that professor Vigeant makes is her distinction between menial labor and abusive labor. In the case of the paper company, it is quite clear that the physical folding of the paper is extremely boring work, however it should not be considered horrible or abusive work. After hearing this, I felt that it was important to return to this point because so many of us now associate outsourced factory work with images of sweat shops. Clearly, there are way too many places in the world in which labor conditions are terrible, and I do not mean to make a defense for this type of behavior, but I think that it is important to remember that there are many companies in the world that do provide good, suitable conditions for their workers. Though not surprising given the massive media attention that is placed upon those companies that fuel abusive behavior, it is really not fair to group them all together. Near the end of her speech, professor Vigeant makes another very important point about how we all have a responsibility to know where our products come from. In all honesty, this was the first time I had ever heard someone say this and it instantly got me thinking. 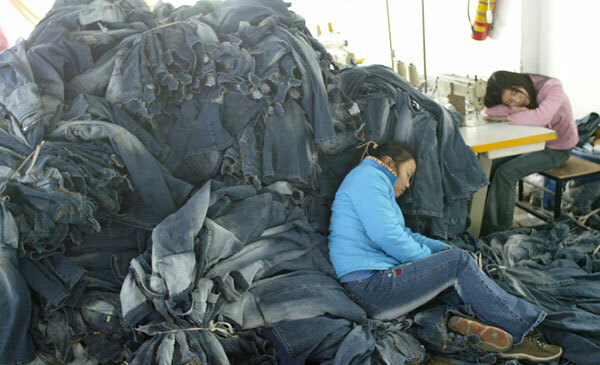 Are we all, as consumers, responsible for knowing where every piece of clothing we buy comes from? It’s an interesting idea, but is it realistic for us to be held accountable for this information when all that a tag says is “made in China”? I definitely think that it is important for all of us to recognize that there is a chance that the shirts that we are currently wearing could have been made in a dangerous factory by someone younger than all of us were when we even started thinking about working. However, there is still so much uncertainty out there about which products are made under these conditions and which are not. Ultimately, I think that it is a great idea in theory, but I still believe that it first falls on the companies to raise their awareness of these practices. What is the real issue among these lies? After listening to Mike Daisey’s monologue on the Foxconn factories in China, there was one comment he made that stood out amongst the rest. It came within the first few minutes of his speech. Like he said, everyone knows that almost all of the technological products that we use in the United States are made in other countries around the world, mostly in China. But that’s about it. Everyone knows that the Eiffel Tower is in Paris or the Coliseum is in Rome, which has no effect on our daily lives, but no one knows where the devices we use constantly throughout every day of our lives originates. That there is a single city in China that is responsible for manufacturing all the electronics we use daily. In many ways, Shenzhen is one of the most important cities in the world to Americans. Yet the majority of us, including myself, have never heard of it. I am sitting here typing this on my Apple computer with my iPhone right next to me and I had no clue where they actually were made. China is a massive country and to say something is made in China is incredibly vague and almost ignorant. Imagine someone from outside the United States, who is a reasonably educated person, saying that the only thing they know about White House is that it is in America and not that it is in Washington D.C. or it is where the president lives. You would probably look at them a little funny. To me, it is baffling that there is this city that so few have heard that plays such a major part in our lives. The reason that comment was the most interesting to me from Mike Daisey’s monologue was because I already knew about the working conditions in these sweatshops in China. I do not know for certain, but I feel that most Americans know this as well. I find it hard to believe that there are people in America that think that these workers in China are getting treating like workers in the United States. I mean that is the reason the factories are over there and not here in the United States. Although most people know about these poor working conditions, it is not something that people want to think about. You would go crazy if every time you opened your computer or looked at your phone you thought of all the workers in China that put them together with their bare hands. Daisey’s Retraction: Do we believe what we want to believe? It was quite surprising listening to the “Retraction” of Mike Daisey’s original podcast about his experience during his visit to China. In the broadcast of “Mr. Daisey and Apple,” Daisey is very persuasive and believable. It is clear from the “Retraction,” however, that he greatly enhanced his stories and stated many lies. By presenting his story as a product of journalism rather than merely a theatrical piece, he deceived thousands of people. His performance was such a strong, dramatic theatrical piece and it made me feel like I was there in China seeing these things with my own eyes. Maybe it made me feel this way because this is what I wanted to see. Mr. Daisey’s use of theatrics during the original podcast confirmed my previous beliefs and preconceived notions of both China and Apple. This was most likely Mr. Daisey’s main intention: to further persuade China/Apple skeptics that Apple is an unethical company and turns a blind eye when it comes to labor. Moreover, Mr. Daisey further gratified my curiosity, and probably many other peoples’, when he alluded to the eeriness in China. This aspect of China is one that I strongly agree with and even experienced first hand when I visited in 2010. Although Daisey blatantly lied and exaggerated his story, I still believe that his original podcast is an important piece. It is important to raise awareness about the working conditions in China, although it is difficult to know what is fact and what is fiction in China, ironically the same issue that Daisey faces in his broadcast on The American Life. The retraction of Dasiey’s article was very surprising. When someone is reporting statistics that are extreme and frightening, it is hard to believe that they would take matters of fact into their own hands. The worst part about such a moving article presenting incorrect facts is that now, the public cannot truly appreciate and believe all the information they previously absorbed. It is hard to realize what was true and what was false and to have faith in any of the information Daisey presented. It was especially inappropriate for Dasiey to present such false facts on a public news station acting as a journalist. When he was asked to present the piece on such a station, he gave up the right to formulate his own story rather than present the public with true and factual information. I was partially sympathetic to his explanation of “shaping” the story. He wanted to raise awareness of the horrific conditions of Chinese factories by including all the shocking anecdotes he heard from factory workers. Even though he had not personally spoke to those affected by the Hexane gas, for example, he wanted to spread awareness that issues like that exist. Unfortunately, he added such extreme aspects to the story that were untrue for anywhere in China, not just at Foxconn. With allegations of guns at the gate and underage workers that were confirmed as false, the shock factor of most of his story vanishes. Yes the conditions are poor and the pay is terrible, but these facts are known. The discussions with workers did not reveal much more information than we have already heard. Daisey needed to add a theatrical value to the piece that just could not be corroborated. Perhaps the worst part of the retraction was Dasiey’s admittance to being fearful of the truth being found out. He lied about his translator and did not allow for all facts to be checked out by a news station. Daisey did not let them do their job: report accurate news to the public. It is even worse that he says at some point he wished the story was pulled. Daisey knew that it was wrong for this story to be heard but he also feared people looking into his facts. Any notability he would have as a journalist would be, and now is, gone. It is important in analyzing his original post and his retraction to realize that opinions are valuable and deserve to be heard, but opinions loose credibility when lies are twisted in. Thinking workers are young is different than blatantly stating their ages and thinking the guards are intimidating is different than stating that they are deadly. Yes, most of what Daisey said is true in a sense. He was trying to formulate truth by mixing stories and details from multiple sources. Where he went wrong was including details that do not exist anywhere. He betrayed the trust of his translator, his employers and the public that listened in to his story. Journalism is an art form – using news to captivate an audience, but the art is lost when one cannot make the truth captivating and instead lies to enhance a story. Listening to Mike Daisey’s interview in the “Retraction” episode was one of the most frustrating academic experiences I have ever faced. I say “academic” because when I listened to the original podcast; I took everything I heard as truth and as educational rather than entertainment. I feel tricked and manipulated. I want to blame myself for trusting a self-proclaimed entertainer to deliver a journalistic message about a topic he is trying draw attention to, but for some reason I cannot. Like Ira from This American Life said, Daisey portrayed his monologue as truth. For me, you cannot use entertainment as a forum to send a message to your audience. If I go watch a standup comedian, I am not expecting all the stories they tell for their jokes to have actually have happened. As long as I am entertained, I’m happy. There is no underlying serious message that they are trying to get across to the audience. They are simply trying to make them laugh. So for Daisey to use the excuse that his monologue is theatre, a form of entertainment, as an excuse for his lies is absurd. I understand that he wanted to evoke a lot of emotion to make people care about the working conditions in factories in China, but the lies discredit any truth that his monologue contains. This whole experience will make me more wary of any opinion pieces I read or listen to in the future. It will also help me to pay attention to the details of an argument and identify clues to question the accuracy of pieces. When the producers of This American Life mentioned the parts of Daisey’s monologue that drew their attention to question the accuracy of it were parts that did not even register with me initially, but when looking back when the brought them up did seem a little odd. The retraction of Mike Daisey’s story about the terrible conditions at the Foxconn plant shows the importance of fact-checking in the world of journalism. Daisey was able to manipulate his listeners into thinking that Apple was an evil company that forced its suppliers into terrible working conditions – or at least did nothing to stop them from occurring. Daisey exaggerated and even fabricated parts of his story to influence the opinions of his listeners to fit his impression of Foxconn and Apple. The graphic and descriptive nature of his story was so realistic that we all believed it to be true without looking at other sources to verify the facts behind his experiences. While I am disappointed that Daisey’s story is fabricated, I cannot say that I am completely surprised. Some of his anecdotes appeared to be stretched to the point where they were hard to believe he accomplished in a few days time, such as talking to “hundreds of workers” outside of the Foxconn gates; however, we believed them because they were on the news and were told in a manner so descriptive that there was an impression that these anecdotes couldn’t possibly be fabricated. This retraction shows that we cannot always believe what we are told, even if it appears to come from a credible news source. Facts can be twisted, exaggerated, or in this case, fabricated, to present a particular view of the person presenting the information. This retraction shows that it is important to look at multiple sources when forming an opinion. A simple Google search “Mike Daisey Foxconn” fills the first page with articles saying that the story was fabricated. I personally feel foolish that I did not look into this or other sources regarding the reporting of Daisey’s story, but it shows that myself and others are quick to believe what is told to us without consulting other sources to verify the merits of a particular story. This argument can be expanded to the news media that try to use facts in a certain context to spin news their way. Whatever the story, it is important to have the facts straight before forming an opinion. Post DUE SUNDAY. COMMENTS MONDAY. What is truth? Lies? Who gets to decide? Now things get complicated. You heard This American Life’s podcast focusing on Mike Daisey’s monologue-play and the issues it raises about Apple, China, worker rights, us as consumers, and globalization. There is a reason I had you listen to that bootleg version. TAL scrubbed the podcast from its website and released “Retraction” in which they devoted a full hour to “retracting” the original podcast. Was Mike Daisey an unethical liar? What, exactly, did he lie about, or not? What is art, journalism, or truth? Who decides? These are some of the questions this new chapter in the story presents. Please listen now to “Retraction.” You can do so on-line here, or you can get it through iTunes or other distributor like Amazon. There is even a TAL app (iphone and droid). In your post, discuss any issue the “Retraction” episode brings to mind. Be sure to include any links to other resources, media, or photographs. Write clearly, but also in your own voice. Please also discuss how your reaction is shaped by the information to which you have access and what that access says about truth, objective “facts” versus “opinions,” lies, meaning, knowledge, and any other aspect of these events that relates to how we know what we know (formally called epistemology- the study of knowing). Your post should be at least three paragraphs. Bucknell’s tech/no performance of the interrupted monologue (Fall 2012). Original and Revised scripts (for free!) from Mike Daisey. As I mentioned in my first blog post, Apple has been reprimanded in the past for its poor treatment of workers, especially in China. This podcast really intrigued me. Since I am a Management and East Asian Studies double major, I have learned a lot about China over the past couple years and have taken Chinese for 7 years. Additionally, since last May I have watched Apple very closely for one of my classes, the Student Managed Investment Fund. With that said, I really understood what Mr. Daisy was talking about. After learning about China and Apple throughout the past couple years and then visiting Beijing and Hong Kong three years ago, I have learned that China is filled with secrets. Apple is no outlier. Even when I went to Tiananmen Square and my mom asked our translator, “What happened here?” she responded with “I don’t know.” Of course she knew. It was very courageous of Mr. Daisy to attempt to break down this wall of secrets. Additionally, I agree wholeheartedly that Apple, a “company so obsessed with details” could overlook the under-aged workers and the conditions they have to work in. Furthermore, as consumers, we need to be more aware of where our products come from, how they are made, and who makes them. I found that Mike Daisy’s recount of the conditions of the Foxconn plant to be very graphic and disturbing. However, I do not think that this is the fault of Apple, but rather Foxconn and the totalitarian regime of China. The reason that the majority of U.S. products are manufactured in China is because the cost is so much cheaper than in the United States. Unfortunately, this cheap labor breeds awful working conditions. The Chinese government does not enforce labor standards, allowing for underage workers, harsh conditions, extended hours, and low wages. Foxconn operates on the basis of many Chinese companies that people are expendable and like parts of a machine. Apple, on the other hand, has done nothing wrong. It periodically checks the plants for stable working conditions and—at least on the surface—investigates any labor issues that occur. Daisy even recounted that Foxconn knew when the plants were being audited and would adjust their standards accordingly. But the real point—though a controversial one—is that Apple needs the low cost labor of Foxconn to exist in the first place. If Foxconn increased wages and benefits to the levels that Americans enjoy, Apple would cease to exist, as the average wage in China is $2.00 compared to the average wage in the U.S. of $34.75 (this would be an additional $25 billion per year in costs and Apple makes roughly $14 billion) 1. While the conditions in China are terrible, we cannot blame Apple for producing its products there to stay in business (focusing on the design of their products that consumers love so much). It is the role of the Chinese government to enact and enforce laws that help the people gain better working conditions, as companies like Foxconn are designed to minimize costs at all costs. However, as we have seen before from the communist China (i.e. sending a 14-year old to the Olympics in 2000), the government only views its citizens as tools to serve the state. Mike Daisey’s monologue about the dreary lives of workers in the factories of Zhenjiang, China seems like a plot to a modern horror film. The constant surveillance, whether it be in the twelve by twelve dorm rooms with thirteen beds, or the hallways and warehouses where thousands upon thousands of people work, is a real life version of the Big Brother defined in novels like 1984 and Fahrenheit 451. The ominous nature of the massive factories described, specifically Foxconn, is very hard for a listener to ignore. The nets put up to deter suicide attempts makes me feel as if that these workers are in borderline prison like circumstances with little freedom and an even lesser amount of hope for progression in the workspace. The number one fact Daisey said that stood out to me is that 430,000 workers are employed and perform services in the Foxconn factory. That is like a small city cramming into one warehouse every day in order to handle assemble small products that are not even sold to their own locality. Daisey’s original assertion that Apple is a religion to people is more true than false when I think about it. People are always out to find and buy the newest product and spend most of their lives using these devices. IPhones, IPads, and Macbooks have almost completely taken over everyday activities and without them some people are completely lost due to their developed dependency. We lose sight of the atrocities that happen in order for these tiny devices to be created. People lose physical functionality, their free will, and in some circumstances, their lives in these factories of that a majority of the time, only benefit the Western World. Like Daisey inferred, do we really need more things to be handmade when these workers give their lives to create our personal devices by hand? Is a man dying from working a 34-hour shift worth a singular phone or computer? Whereas Microsoft and others ruled the tech market in the 1990s and early 2000s, Apple has emerged in the past 10 years as the undisputed titan of the industry and has achieved an almost legendary status among businesses and consumers alike. Innovative and revolutionary products, such as the iPod and iPhone, have reached such exceptional levels of popularity among today’s consumers that it has become extremely rare to meet someone who does not own an Apple product of some kind. With this, Apple’s former CEO Steve Jobs has become an almost god-like figure, being praised as one of the greatest innovative minds of all time. Much like Fran Hawthorne points out in Ethical Chic, such great admiration for the company has created an aura around Apple that, if it is producing such amazing products, then every aspect of the company must be great. In the radio excerpt from This American Life, Mike Daisey talks about how easy it is to fall into this trap and how his view of the company has been altered by his own personal investigation of Apple’s manufacturing practices. What was particularly compelling about Daisey’s story was how pertinent it is to my own experiences with Apple. Essentially growing up during the rise of Apple products, I too have created this image of Apple as a ‘perfect’ company that is light-years ahead of the competition. And, not surprisingly, I have not thought too much about where exactly my iPhone comes from beyond the ‘Made in China’ labeled on the back. However, Daisey points out that we should all take a closer look at this issue because, after examining it in person, it appears to be quite troubling. Daisey’s description of the FoxConn plant in Shenzhen, China is very disturbing to hear about, but the question that remains is whether it is really enough to materially affect consumers’ attitudes about Apple and its products. It is really no secret that the majority of major US companies outsource work to factories in less regulated countries such as China and yet, consumers continue to purchase the products without fail. At the end of the day the question that remains is: are people really going to purchase a worse product because they are concerned about the conditions under which it is made? The unfortunate answer to this question is no. As more and more people start to place more emphasis on corporate responsibility, the strength of this answer may be changing, but still very gradually. Ultimately, one has to wonder what it will realistically take for people to feel compelled enough to stop purchasing from a company such as Apple because of the way that it behaves. I tend to believe that it must be something radical, but maybe time will tell.